With the explosion of Mobility solutions over the last decade, online and mobile shopping have become the most convenient and prevalent methods for consumers to research and purchase products. Gone are the days of traveling to multiple stores to compare and price shop. Everything is now available from the comfort of your home with a few clicks. According to a survey conducted by Square and Mercury Analytics, 51% of Americans prefer to shop online and 80% with an internet connection will have made a purchase in the past month alone. With the decline of the mall format and a shift from brick-and-mortar stores to online or mobile app shopping, customer experience will be key to online brands gaining or keeping market share. In fact, brands are now seeing that gen Z shoppers prioritize the experience as much as they do the price. Brands are looking at all avenues to build more personal relationships with their customers at scale. But even with website personalization, the interaction can still feel impersonal. Enter conversational commerce! With conversational commerce, brands can connect with their customers on a more personal level via chat or messaging apps with natural language interaction. This format of communication elevates the online purchasing experience with a personal touch as well as deepens the customer relationship for increased long-term loyalty. It is relatively new in the scene, but it is already bringing brands and customers closer by bridging the communication gap. Through different messaging apps like WhatsApp, Skype, Facebook Messenger, Slack, Kik, Snapchat, WeChat*, etc, conversational commerce aims to make interactions easier allowing customers to communicate with you how they wish without having to navigate to a different area of the website, via a form or another app or a phone call. According to reports, as of Feb 2018, Facebook Messenger had 1.3 billion monthly users, superseded by WhatsApp at 1.5 billion monthly users. Snapchat, on the other hand, had 267 million monthly users*. Fast access and a simple user interface (UI) are two of the prime features that have launched these apps into popularity. Moreover, they are providing potential customers with one of the simplest forms of communication with businesses that choose to adopt them. Conversational commerce interactions via chatbots allow customers to discuss their needs with the speed and agility they expect, while providing them with convenience and flexibility and more importantly, time to think before taking a decision. Intelligent automation solutions like voice-assistants, are going a step further to add voice interaction via chat for not only those who wish to engage in this fluid way, but to also engage shoppers who may have disabilities. Talk about better customer engagement and a personalized shopping experience! Alexa, Google Assistant, Cortana, and Siri have added a completely new dimension to a “luxurious” customer experience with an ease that has taken conversational commerce to a whole new level. Voice shopping is expected to account for $40 billion in U.S. consumer spending by 2022, according to a study from OC&C Strategy Consultants. One report found that 37 percent of voice assistant users would share a positive experience with friends and family, and 28 percent of current non-users would want to transact more frequently with a brand following a positive experience. Users that have a quality experience with a voice assistant, are more likely to use it more, which improves revenues. By the end of the January 2019, it is expected that Google Assistant will be on 1 billion devices — up from 500 million in May 2018. And Amazon claims 100 million Alexa devices have been sold. 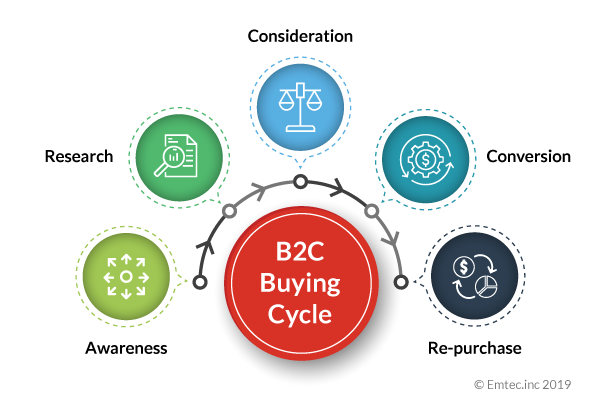 The typical buying cycle in a B2C scenario consists of 5 main stages: Awareness, Research, Consideration, Conversion and Re-Purchase as indicated in the graphic below. Conversational commerce platforms can help elevate the experience across all phases by creating a need for their products as well as a friction-less and easy purchasing process. An OpenMarket survey found that people would prefer to communicate with brands through a text message rather than email, phone or social media. As an example, eBay’s Messenger Shopbot helps consumers through their purchasing process utilizing Facebook Messenger. Burberry provides various shopping options through an entertaining customer service experience. Trulia, a leader in the real-estate space, offers a practical chatbot solution for search options based on pricing, location, and different required home parameters. With Absolut, its bot offers free cocktails and notifies users with offers nearby. In fact, interactions go way beyond brand websites. With smart chatbots/voice-assistants interacting through social media channels, brands are impacting user perceptions to improve image, brand popularity and generate more revenues. Awareness: During the awareness stage, consumers may not be aware they need a product or service. This is where need can be created by pushing out relevant content through campaign promotions, video ads and social media announcements. Conversational commerce can help to generate awareness of additional products or services based on customer demographics and address any questions the shopper may have as part of the process. This is a great way for online businesses to educate consumers about the latest trends, popular products, new offers, and discounts. Research: This is the most influential stage of the customer’s purchasing journey. In this age of online shopping, consumers are quite savvy with their research. They want to know all their options before proceeding with a purchase. With the help of conversational commerce, chatbots and voice assistants can become personal shopping assistants, answering questions on the fly. With simplest of conversational questions such as “is the red dress of xyz brand available?”, or “show wedding dresses within a specific price range”, shoppers get the answers they need quickly, reducing the need for them to go elsewhere for more information. Consideration/Recommendation: As prospects identify and settle on products they wish to most likely purchase, conversational commerce chatbots can also recommend similar or additional products to create upselling opportunities. Conversion: Conversational apps can help customers through the purchasing /conversion stage as well. The bots can offer feasible buying options on-the-go and assist in the overall process ensuring customer satisfaction, thereby creating a customer for life. The bots, armed with insights about past purchases and current geographic location can suggest different buying options – i.e. using a card from a specific bank, highlight discount options and more. Re-purchase: Once a sale is complete; the buying cycle shouldn’t stop there. It is important for brands to be there to help customers through initial product usage and address any questions they may have. 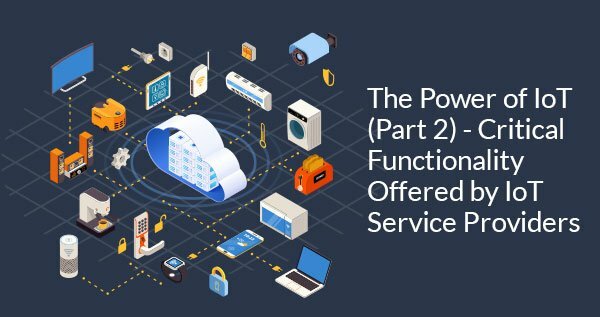 Bots can be extremely effective here to ensure the customer doesn’t have any issues with the product or service or require additional support. Brands that make it easy for their products to be utilized have higher repurchase rates, more positive reviews, and public referrals and recommendations. According to reports, Snapchat has rolled out shoppable stories with select eCommerce partners such as Lancome and Target in the discovery section of the app to monetize its daily user base of more than 160 million. By effectively using conversational commerce in e-commerce, brands are enhancing the overall shopping experience with powerful impact. Lower operational cost: Utilizing chatbots across all stages of the buying cycle can be cheaper in the long run than utilizing live customer service personnel. Focus live personnel on addressing more complex and intricate questions which bots may not be able to handle. Improved customer experience: Consumers have more options to interact with your brand in the way they are most comfortable. Questions and product searches are quickly resolved using natural language and with the help of intelligent conversational bots, guidance can be given at any point in time. This may become a bit difficult when humans are handling multiple simultaneous queries over a long period. Real-time recommendations: Conversational commerce assistants are smart enough to learn through interacting with consumers. They can offer recommendations in real-time based on prospect demographics, browsing history and more. 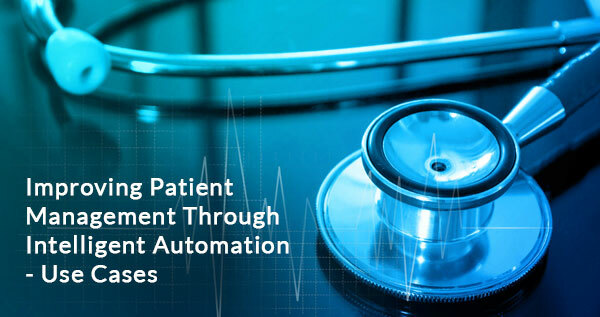 With the help of intelligent automation tools like chatbots/voice-assistants, customers save time while enjoying an extremely personalized experience. The entire purchasing process becomes more dynamic, easy and non-intrusive. Brands who have embraced conversational commerce for digital transformation help customers make well-informed decisions and increase lifetime value through brand loyalty. Have a scenario where conversational commerce could improve your customer experience and generate more revenue? Contact us to get started. “When responsiveness meets discoverability, users get the best of conversation and the internet together,” - Derry Finkeldey, research director at Gartner. Ashwin has over 10 years of experience in the IT and application development industries, contributing to software projects in varying domains like employee giving, web-based student services, education, etc. He holds AWS certification and is an open source enthusiast. As part of the Emtec development team, Ashwin is a full stack developer and manages teams providing support for different technologies like node.js, express, Loopback and ReactJS.